In a city filled with plenty of non-cheap attractions, it's not always easy to find a free activity to bolster your budget. Cue the wave of summer outdoor movies hitting virtually every corner of D.C. this summer and, at some spots, into September. Scroll on to see the endless (really, the list just keeps going) movie-watching possibilities in D.C. NOTE: Film schedules are subject to change due to weather and such things. Please check with the venue to verify dates and times before you head out. Adams Morgan Movie Nights-- Marie Reed Elementary School Field, corner of 18th Street NW and California Avenue NW. Movies begin half an hour after sunset. June 10: "All the President's Men"
Capitol Riverfront: Front Flicks-- Canal Park, 250 M St. SE. Movies begin at sunset. July 10: "Balls of Fury"
July 31: "Bend It Like Beckham"
Aug. 14: "A League of Their Own"
Aug. 21: "The Blind Side"
Golden Triangle: Golden Cinema Series -- Farragut Square, Connecticut Avenue NW and K Street NW. Movies begin at 7:30 p.m.
June 13: "My Date with the President's Daughter"
June 20: "Legally Blonde 2"
July 11: "The American President"
Family Night at Sursum Corda -- Loree Grand Field, 2nd and L streets NE. Movies begin at 7 p.m.
July 22: "The Lego Movie"
NoMa Summer Screen -- Loree Grand Field, 2nd and L streets NE. People start gathering at the field at 7 p.m. for music, giveaways, food trucks and other activities before the movie begins. 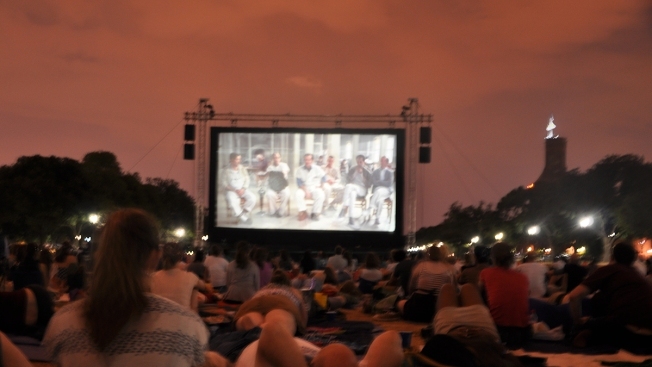 June 25: "When Harry Met Sally"
July 16: "The Perks of Being a Wallflower"
July 23: "The Dark Knight"
Screen on the Green -- National Mall, Constitution Avenue between 7th and 12th streets NW. Movies begin at 7 p.m.
July 21: "The Karate Kid"
July 28: "Lover Come Back"
Aug. 11: "A Soldier's Story"
U Street Movie Series: Harrison Field Under the Stars -- Harrison Recreation Center field, V Street NW between 13th and 14th. Movies begin at sunset. July 16: "Talk to Me"
Aug. 20: "The Tribute Concert to Chuck Brown: Put Your Hands Up"
Sept. 17: "The Bayou: DC's Killer Joint"
Bethesda Outdoor Movies--Woodmont Triangle, corner of Norfolk and Auburn Avenues, Bethesda. Movies begin at 9 p.m.
July 22: "Ferris Bueller's Day Off"
Columbia's Lakefront Summer Festival -- Columbia Lakefront Stage, 10275 Wincopin Circle, Columbia. Movies begin around 8:30 p.m.
June 27: "Saving Mr. Banks"
July 18: "Thor: The Dark World"
July 21: "Despicable Me 2"
July 25: "Iron Man 3"
Aug. 1: "Superman: Man of Steel"
Aug. 4: "Ernest and Celestine"
Aug. 22: "The Hobbit: An Unexpected Journey"
Aug. 23: "The Hobbit: The Desolation of Smaug"
Aug. 29: "The Princess Bride"
Aug. 31: "The Lego Movie"
Sept. 5: "Mr. Peabody and Sherman"
Sept. 6: "The Monuments Men"
Sept. 12: "Muppets Most Wanted"
Sept. 13: "Captain America: The Winter Soldier"
Greenbelt Moonlit Movies--Greenbelt Aquatic and Fitness Center, front lawn, 101 Centerway, Greenbelt. All movies begin at 9 p.m.
June 14: "Meet Me in St. Louis"
June 28: "The Princess Bride"
July 12: "The Wizard of Oz"
July 19: "Willy Wonka and the Chocolate Factory"
Aug. 2: "Raiders of the Lost Ark"
Aug. 16: "The Muppet Movie"
Sept. 6: "Singin' in the Rain"
Sept. 20: "Ernest and Celestine"
Laurel Department of Parks and Recreation Outdoor Movie-- 8th and Montgomery streets, Laurel. Starts at dusk. Friday, Sept. 19 -- "Muppets Most Wanted"
Laurel Friday Flicks -- Granville Gude Park, 8300 Mulberry St., Laurel. Movies start around 8:15 p.m.
July 18: "The Nut Job"
July 25: "Cloudy With a Chance of Meatballs 2"
Aug. 8: "The Lego Movie"
June 29: "The Princess Diaries"
July 20: "Willy Wonka and the Chocolate Factory"
Aug. 3: "Singin' in the Rain"
Aug. 17: "From Russia, with Love"
Aug. 31: "You Only Live Once"
Rockville Town Square: Movies on the Square-- Rockville Town Square, 200 East Middle Lane, Rockville. Movies start around 8:30 p.m.
June 12: "Cloudy With a Chance of Meatballs 2"
June 19: "Saving Mr. Banks"
June 26: "The Hunger Games: Catching Fire"
July 10: "The Secret Life of Walter Mitty"
July 31: "The Lego Movie"
Aug. 7: "Anchorman 2: The Legend Continues"
Aug. 14: "Star Trek Into Darkness"
Aug. 21: Despicable Me 2"
Summer Movies at the Wine Bin -- 8390 Main St., Elliot City. Movies start at 9 p.m. in June, July and August, and at 8 p.m. in September. July 19: "When Harry Met Sally"
Aug. 2: "Mr. Peabody and Sherman"
Aug. 9: "Jack Ryan: Shadow Recruit"
Aug. 16: " To Catch a Thief"
Aug. 23: "Life of Pi"
Aug. 30: "The Princess Bride"
Sept. 20: "Rock of Ages"
Sept. 27: "Monty Python and the Holy Grail"
Cinema Del Ray -- Mount Vernon Recreation Center, 2701 Commonwealth Ave., Alexandria. Movies begin at sunset. June 21: "Despicable Me 2"
July 19: Cloudy With a Chance of Meatballs 2"
Aug. 16: " The Lego Movie"
Crystal Screen: In Flight -- Crystal City, 1851 S. Bell St., Arlington. Movies begins at sunset. June 16: "Planes, Trains & Automobiles"
July 14: "Up in the Air"
Aug. 25: "Snakes on a Plane"
Lovettsville Movies on the Green -- Lovettsville Community Center, 57 E. Broad Way, Lovettsville. All movies begin at dusk. Aug. 8: "Babe the Gallant Pig"
Sept. 12: "The Lego Movie"
Loudoun Station's Cinema Under The Stars(Plex) -- Loudoun Station, 43805 Central Station Dr., Ashburn, Va. All movies begin at sunset. July 5: "The Lego Movie"
July 26: "Despicable Me 2"
Aug. 16: "Cloudy with a Chance of Meatballs 2"
Mosaic District: Films in the Park-- Strawberry Park, 2910 District Ave., Fairfax. Movies begin at 7 p.m.
June 13: "The Hunger Games: Catching Fire"
June 20: "Man of Steel"
Aug. 1: "Julie & Julia"
Aug. 8: "Charlie and the Chocolate Factory"
Aug. 15: "Fried Green Tomatoes"
Aug. 29: "My Big Fat Greek Wedding"
Movies Under the Stars -- Pinn Community Center Tennis Court, 10255 Zion Drive, Fairfax. All movies begin at 8 p.m.
Rosslyn Film Festival -- Gateway Park, 1300 Lee Highway, Arlington. Movies start at 8 p.m.
June 20: "Thank You For Smoking"
June 27: "Two Weeks Notice"
July 18: "How to Lose a Guy in Ten Days"
July 25: "Up in the Air"
Aug. 1: "9 to 5"
Starlight Cinema Centreville-- 5875 Trinity Parkway, Centreville. Gates open at 6 p.m.; movies begin at dark. Aug. 9: "Despicable Me 2"
Aug. 30: "The Lego Movie"